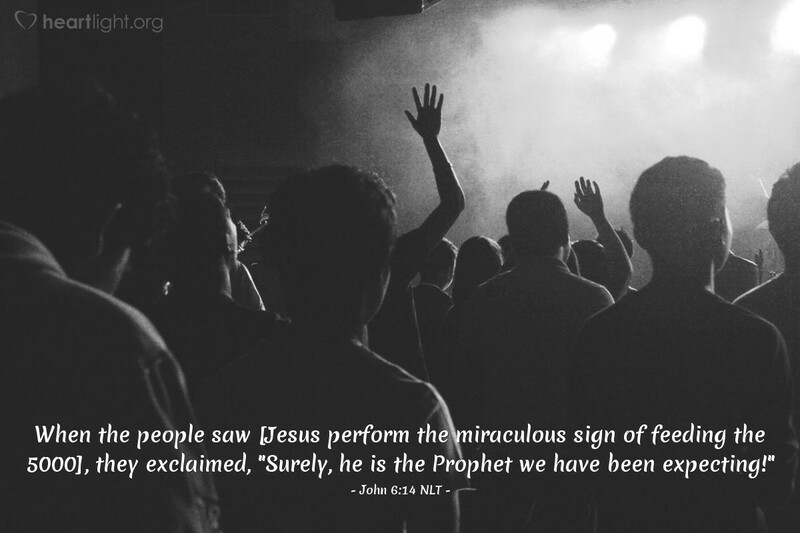 When the people saw [Jesus perform the miraculous sign of feeding the 5000], they exclaimed, "Surely, he is the Prophet we have been expecting!" The people were "wowed"! They recognized something incredible had happened. When they first saw the miraculous sign, they were convinced that something great was going on. But their reaction didn't last long as this was the "miracle on demand" crowd (John 6:30). Unfortunately, they let their praises die down and their desire to see another "miracle show" rev up. God still does mighty things among us today. When he does them, let's praise him. Even when we endure a season where he doesn't appear to be working, let's remember that he is still at work even if the things he does remain unseen. Let's be drawn closer to him — not to see another mighty deed, but to give him our hearts. The mighty deeds will come in God's time, not ours. So instead of focusing on our expectations, let's focus on God's incredible work among us! Father, thank you for your mighty deeds throughout history. Thank you for your mighty deeds in my life as well. I can see only an incredibly small glimpse of all that you have done, and yet I am awe-struck, and I praise you. In the name of Jesus, Amen.